We served these with a big salad as a side and I thought it was delicious but I did make them of course. I used canned spinach because I had some on hand but they would be so much better even with fresh spinach. I'm a huge garlic person so I put in 2 teaspoons but easily could have doubled it to 4. You know those big jars of garlic in the grocery store produce section that are like $5 and you walk by them and say to yourself "who would buy that much garlic?". Me. Yup, that's all we buy in this house unless there is a need for fresh garlic for roasting or something. We are true garlic lovers. I don't mess around with that tiny jar that is $3 or $4 mind you. 1. Heat oven to 350F. 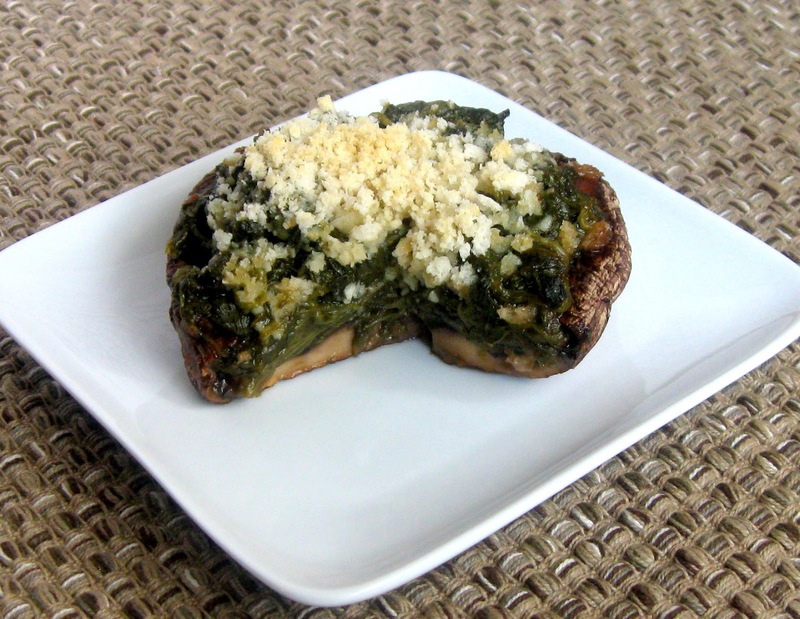 Lightly brush each mushroom with 1-2 teaspoons olive oil then place on a baking sheet and bake for about 8 minutes with the top of the mushrooms up. 2. While the mushrooms are cooking, over medium heat saute garlic in 1 teaspoon olive oil about 1 minute, stirring frequently. Add spinach to pan and stir. Season with salt and pepper and heat through. 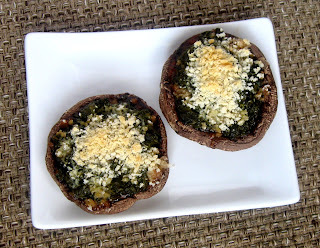 If using fresh spinach cook spinach down in pan then season with salt and pepper. 3. 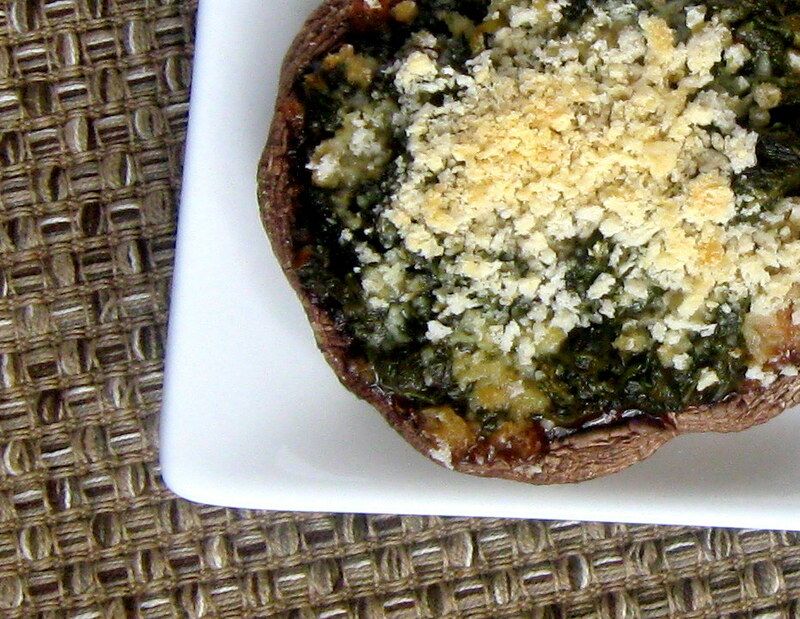 Remove mushrooms from oven and flip over to fill them. 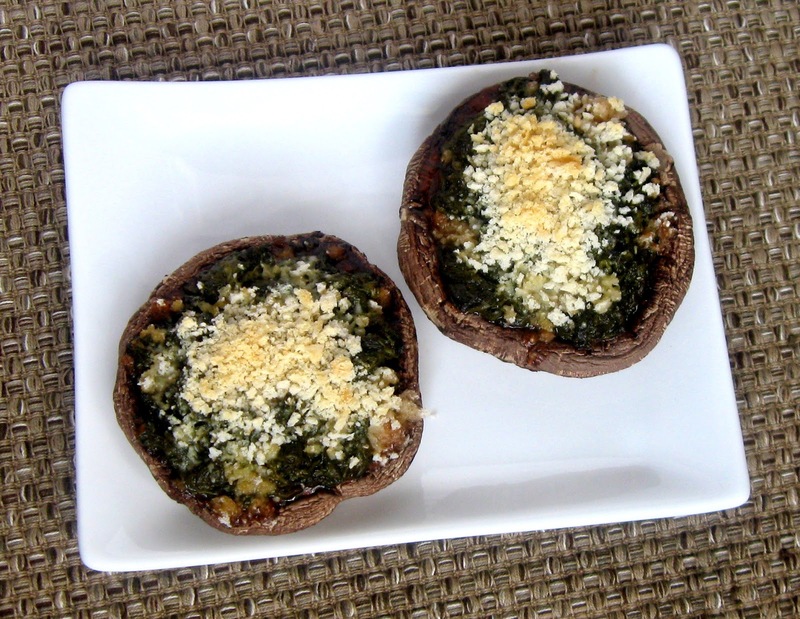 Spread 1-2 tablespoons of spaghetti sauce in each mushrooms then divide the spinach evenly between the three mushrooms. 4. In a small bowl mix together the Parmesan cheese and Panko, sprinkle over the spinach in the mushrooms. 5. Return the mushrooms to oven and bake 10-15 minutes or until lightly browned on top.